Few experts, be it biased humans and/or statistically influenced simulation engines, predicted a San Jose Sharks vs. Pittsburgh Penguins Stanley Cup Final. Yet, here we are after the two teams fought their way through the Eastern and Western conference fields. I thought because the WhatIfSports NHL simulation engine generates its projections based on the statistical DNA of all Stanley Cup playoff squads, it would be worth comparing the Pens and Sharks regular season and playoff resumes. Both offenses have scored more goals per game in the 2015-16 playoffs, while the goaltending has also improved. Pittsburgh’s Marc-Andre Fleury started the majority of the regular season – which, again, powered the pre-playoff simulation – but suffered his second concussion late in the season. With Fleury unable to return by the start, rookie Matt Murray has stepped up in the playoffs in a big way. Murray only had 13 regular season starts compared to the 15 games he’s started this postseason. He’s 11-4 allowing 2.21 GPG. The Sharks have been led by 24 points via Logan Couture. You may remember, Courture missed a chunk of the season due to injury back in 2015. He’s scored eight goals and dished 16 assists in 18 games this postseason. 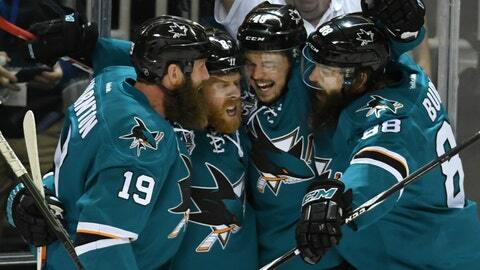 Joe Pavelski leads the Sharks with 13 goals. We simulated the 2016 NHL Stanley Cup Final 1,001 times and the computer likes the Sharks to raise Lord Stanley in their 25th season! You can see the breakdown below and simulate the Final as many times as you want for FREE! Note: We’ve also simulated with and without Penguins’ defenseman Trevor Daley, who’s out for the Finals. With Daley OUT the Pens lost a guy second in time-on-ice this postseason and the Sharks’ win percentage increased from 53.2% to 57.1% and goals increased from 2.35 to 2.50.